Peaches and nectarines are low in calories, fat and sodium and contain vital nutrients that help maintain a healthy lifestyle. 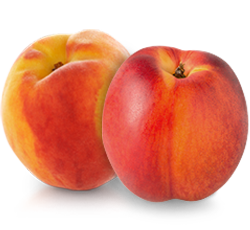 Ontario leads Canada in both peach and nectarine production with 82 per cent of the national production. The flesh of these peaches partially clings to the pit and are excellent for eating out-of-hand. Varieties include Harrow Diamond, Springcrest, Candor, Harrow Dawn, Early Redhaven, Garnet Beauty, Risingstar, Brighton, Sunhaven, Harbelle and Sentinel. The flesh of a freestone peach separates easily from the pit, making it perfect both for eating fresh and for preserving. Varieties include Redhaven, Vivid, Harbite, Harson, Blazingstar, Harrowfair, Starfire, Veeglo, Harrow Beauty, Loring, PF24, Allstar, Coralstar, Metronidazole, Redskin, Glowingstar and Harcrest. Fantasia has firm yellow flesh; the skin is bright red over a yellow background. It's great for eating with intense flavour. Harblaze is a medium to large fruit with yellow flesh and mostlyred skin.